In 1978, Sandra and I relocated to the Marble Falls community and opened Ken’s Heating And Air Conditioning. With my experience and personal contacts in the air conditioning business. I was able to locate the best products and prices and extend those products to area residents. After 36+ years and a 2nd generation of family ownership, we still strive to offer our many, many friends and customers the best values in the industry. Please take a few minutes to explore our website and learn more about our services and products we recommend. If you have any questions please don’t hesitate to contact us. By Choosing Ken’s Heating And Air you will be choosing an air conditioning company that knows all of the codes and laws ensuring that your new air conditioning system is installed correctly. We have the necessary licenses and insurance to ensure that your air conditioning system is installed safely, correctly, and if a worker is injured you will not be held liable for any damages. Never worry again if the air conditioning repair company you are calling will be there to stand behind their work. We have been in business since 1978 and will be here for many years to come. Peace of mind is great and when you purchase a new York air conditioning or heat pump system from Ken’s Heating and Air not only are you receiving the best installation, expert technicians, and quality customer service you are also receiving the best a/c warranty on the market. Your new air conditioning or heat pump system is covered for the next 10 years. Our parts and labor warranty covers all equipment failures so you don’t pay a dime on repairs for your air conditioning system for 10 years. For more information on our 10 year warranty contact us today! Meet Ken! Ken has over 40 years of experience in the HVAC industry. He sold his company to his daughter, Cheryl, in 2009. 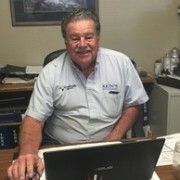 Even though he is “retired” Ken still seems to find his way into his service truck and the office, however when not repairing air conditioning and heat pump systems Ken can be found target shooting with his daughter Cheryl, riding his motorcycle, and spending time with family and friends. This is Cheryl. 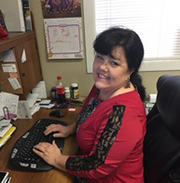 Cheryl is the owner of Ken’s Heating and Air and has 21 years of experience in the HVAC industry. Cheryl bought the company from her father Ken in 2009 and even though Ken is “retired” he still can’t seem to stay out of the office. When Cheryl isn’t troubleshooting and dispatching she can be found target shooting, usually with Ken, shopping, usually without Ken, and is the treasurer for Highlands Lakes Service League. Fernando has 12 years of experience repairing air conditioning systems, heat pumps, refrigeration systems, and ductless mini splits. In his spare time, he is an avid fresh and salt water fisher, golfer, and enjoys spending time with his wife, family and friends. Abran (AB) came to us from the refrigeration and appliance sector. He has quickly learned about HVAC systems and added residential repairs to his area of expertise. When he’s not working, he enjoys fishing, kayaking and being with his finance and family. Ivan graduated in 2015 from Texas State Technical College with an Associate of Applied Science degree in HVAC Technology and is also NATE Certified. He enjoys spending time with his family and friends along with being an avid soccer player in his spare time. Josh has over 4 years of experience in residential/commercial applications and refrigeration systems which means he is our “go-to” guy on all the restaurant equipment repairs and preventative maintenance. He enjoys golfing and riding dirt bikes during his time off work.